What I like to achieve is assigning a hotkey to jump directly to the folder that I queued. I do not mean jumping to the top library folder (not open file(s) or open folder) but to the one folder which contains the queued files. How please? 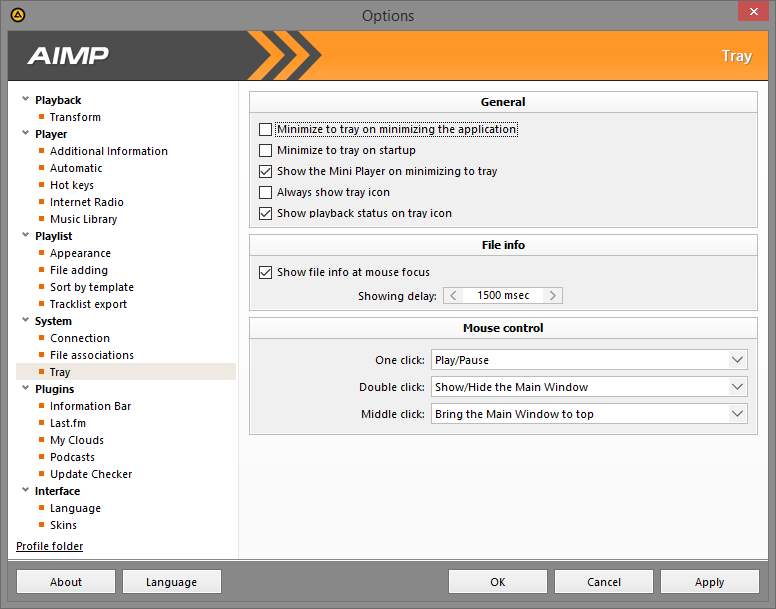 Question two: in Windows I usually queue one folder with AIMP context menu. Can the context menu be moved to the main Windows context menu instead of first scrolling right, by editing the registry, and how could I remove some of the AIMP context items? 1. Do you mean file location? Alt+O by default for the selected file. You can change the hotkeys in the settings (Preferences > Player > Hot keys, search "location"). 2. No need to edit the registry. Go to Preferences > System, disable Integration, Apply, open Profile folder (bottom left), close AIMP, edit AIMP-ContextMenu.ini (disable Cascade, etc). Then re-enable integration. Allow me to ask you another about the Mini Player. In Windows 10 I use the minimize all windows option a lot, the small space on taskbar bottom right corner. From the minimized state clicking the area again to maximize all windows, Mini Player also pops up but I want it to stay in tray until I call it. I think this behavior cannot be controlled. 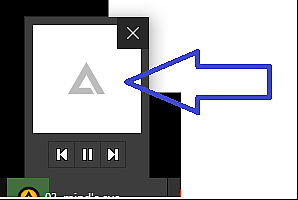 You can turn on/off the "Stay on top" option separately for the main window and mini-player, dock or completely disable the mini-player, dock or minimize to taskbar the main window (try RMB on minimize button). dock or minimize to taskbar the main window (try RMB on minimize button). Oooh... that's new to me and seems a big improvement over having to aim for the tray icon due to the miniature size. Happy you mentioned it! And the player will be minimized with the left mouse button on the taskbar, and not in the tray. But the ability to minimize to the tray will remain, but it will be available through the right click. Excellent, lots of configuration possible. Decided on right click minimize to taskbar and bury using tray together with Windows 7. It's spring after all. - How do I prevent permanent playlist creation and their storage to disk? 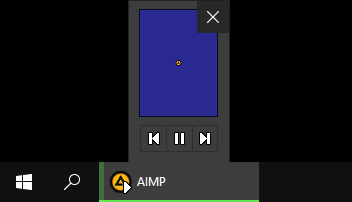 I prefer AIMP to forget on exit what I have previously played. - Under Playlist:files adding, a hotkey opens file(s) but what determines which folder is opened in Windows? Here a folder opens which is not currently playing and is not a previously stored playlist. 2. What exactly you mean? 1. Prefs/Playlist: under "saving", un-check "Save playlist 'Default'"
2. Prefs/Playlist/File Adding: for "when files are being opened", select "Add to empty playlist 'Default'"
Let me rephrase. Which hotkey brings me always to the same top library folder in Windows? Here I see no option to turn off album art. See attachment to understand what I want. That was very helpful. No more playlist garbage. Thanks a lot! Ok! But results in a blue square regardless of Windows appearance settings. Hard to live with To please the eye I shall prepare for mass album art import.